Surface Prep. Coatings for Printing to Glass. The ability to print to glass opens up a range of opportunities for the digital print industry. However, this process may prove difficult as many variables come into play. Pre- and post- treatments for printing to glass aid in prepping the glass surface to ensure adhesion success. In theory, any type of glass can be printed onto. The two most popular types of printed glass include float or flat glass and container glass. Many factors influence surface tension—or dyne level—and the adhesion of ink on glass. Sean Lanigan, president, Applied Surface Technologies, LLC (AST), explains that some of these variables are easily resolved, while others require specialized processes. He adds that everything impacting adhesion of inks and coatings on glass falls into two main categories, corrosion and contamination. Corrosion comes from within the glass itself or something that attacks the surface. Lanigan says chemicals within the glass reacting with one another and lime scale are examples of corrosion that could affect ink adhesion. On the other hand, contamination is something that can be applied to the glass or that may land on the glass surface but may not damage the surface. Mold release coatings and dust are examples of contamination, explains Lanigan. He also notes that there are additives used to color glass or change certain properties, but these normally don’t cause more issues than clear glass. Several pre-treatment options are available to help improve the surface tension of glass to enable digital printing. Primers are easily applied and available from many sources, including equipment manufacturers, ink manufacturers, and industry suppliers. “Some testing is usually necessary to find the right primer for the adhesion and durability required. Keep in mind that a primer that works great for plastics or metals may not offer any adhesion improvement with glass,” recommends Lanigan. He suggests that some pre-treatment will always be required with glass to ensure a proper hydrophilic surface. “This can be achieved with glass cleaners, primers, or specialty glass cleaners like Glass Renovator from ClearShield Technologies, LLC or Vitranova from Vindico Surface Technologies. It is also possible to use a propane torch to remove contamination and get a good dyne level. These are available at any hardware store for under $20,” he shares. He adds that it is also possible to use a post-treatment solution like a spray coating to protect the ink print. Acrylic and clear coat sprays work well for many applications and can be purchased at hardware stores. He says many of the UV ink manufacturers including Marabu North America, Peter-Lacke GmbH, RUCO Druckfarben, and Sun Chemical offer more industrial spray-on coatings for higher speed production. If you have a good dyne level on glass, which would be a measurement of 45 or higher, Lanigan says you can digitally print on glass. “Different inks react to different glass surfaces in various ways. Some inks may allow for a limited scratch resistance, while other inks may be removed by simply wiping the surface. How inks react to the glass and the adhesive properties must be tested,” he cautions. The second option is utilizing Pyrosil technology, which applies a flame and a proprietary liquid mix to the surface, leaving silicon dioxide (SiO2) on the glass making it hydrophilic. Pyrosil is available through AST. “Pyrosil is a flame technology that deposits SiO2 onto surfaces—including glass—and changes the surface allowing for 72+ dyne level and greatly increased adhesion and durability. This technology is easily applied using a handheld torch, tabletop unit, semi-automated, or fully automated process depending on customers’ needs and output demand,” explains Lanigan. He explains that Pyrosil was developed in the 80s and is required by BMW and Jaguar for their authorized automobile repair facilities. AST offers a variety of additional primers and pre-treatment solutions. In addition to Pyrosil, the company is the North American distributor of primers from Germany-based Modico Graphic Systems and SURA Instruments. Lanigan says pre- or post-treatment is recommended in nearly every situation, but there are exceptions. “If you are making an enclosed glass display where the ink will not be exposed nor require cleaning, pre- and post-treatments may not be necessary,” he explains. Pre-treatment of container glass is critical to achieve optimum adhesion. Jackman shares that the reason for this is that glass containers commonly have anti-scuff coatings applied during manufacture. “To achieve adhesion, the surface of the glass must be altered,” he comments. For greater scratch resistance, pre-treating the glass with primer—like wipe on, spray, and printable corona/plasma, flame, or Pyrosil treatment may be enough to meet customers’ requirements, adds Lanigan. While pre- and post-treatments are available to aid in the adhesion of ink to glass using digital print processes, there are limitations. For example, food safety is one consideration. Inks for printing onto glass are only suitable for the non-food contact side of glass containers, points out Jackman. “As glass is considered an effective barrier for migration, there aren’t too many restrictions on the ink chemistry options,” he shares. “Some acrylate-based inks do not contain any mono-functional acrylates and use polymeric photoinitiators to initiate the polymerization reaction. It is is crucial to full cure the ink with the specific UV dose to maximize the degree of polymerization,” explains Craig Greenwood, sales manager, North America, Tiger Drylac U.S.A., Inc. If a pre- or post-treatment is to be used for food and beverage applications, Lanigan says there are FDA regulations and requirements although they may not require FDA approval, which can be quite expensive. For example, if printing will not come into any contact with the lips, you can decorate a beer bottle and it would not require FDA approval. The state of CA’s Proposition 65 should also be considered, cautions Lanigan. “Many chemicals are restricted, check with the supplier and/or manufacturer of all products and enhance compliancy,” he recommends. Besides food safety, factors such as exposure to water come into play. 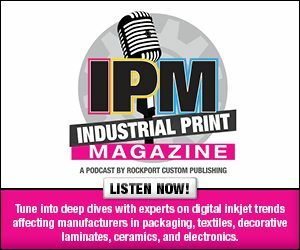 Lanigan suggests that when looking at digital printing that will be exposed to water, like drinkware, beer, and spirit bottles, a more specialized treatment process is required. Corona/plasma or Pyrosil in conjunction with primers can withstand hundreds of dishwashing cycles. “I am not aware of any primer that can withstand more than a dozen cycles in a dishwasher, although there are continuous improvements in the industry,” shares Lanigan. Printing directly to glass with digital technology is an attractive solution. However, printing to this medium requires proper surface tension. Pre- and post-treatments help ensure a high-quality result.